SCVHistory.com LW3088 | Film-Arts | Lantern Slide: Buck Jones in 'The Avenger' (Columbia 1931). 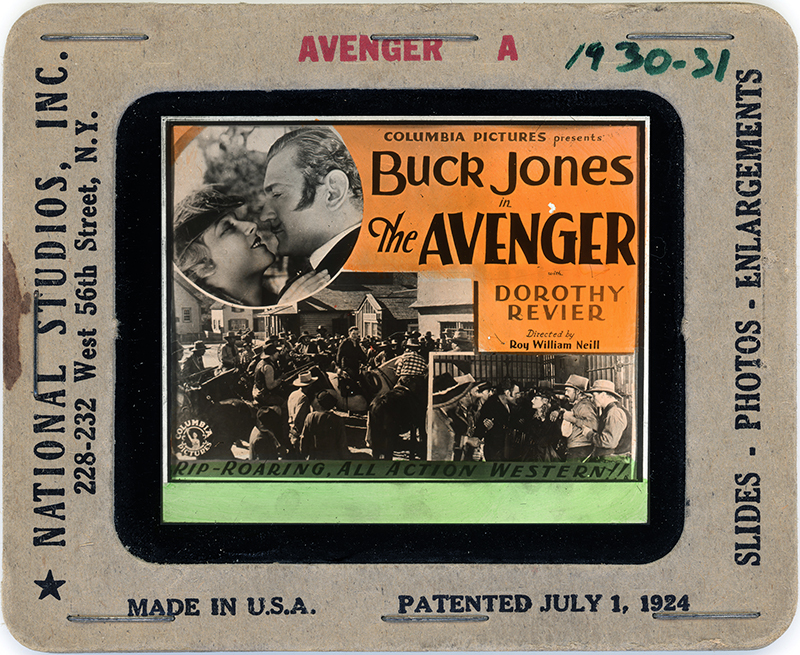 Buck Jones in "The Avenger"
Magic lantern slide advertising "The Avenger" (Columbia 1931) starring Buck Jones. The movie was filmed in part at Vasquez Rocks. Ironically, the story is about the central/northern California bandit Joaquin Murrieta, and it's shot at the onetime hangout of our Southern California bandit, Tiburcio Vasquez, whose reign of terror lasted 22 years, versus just 3 years for Murrieta. The film also used the Western Street set at the Paramount Ranch in Agoura. Jones plays the part of Murrieta. Also featured: Dorothy Revier, Otto Hoffman, Sidney Bracey, Edward Hearn, Walter Percival and Edward Peil Sr.
Uncredited cast includes some famous cowboy stuntmen: Ethan Allen, Ralph Bucko, Roy Bucko, Ben Corbett, Frank Ellis, Paul Fix, Billy Franey, Al Taylor, Blackjack Ward and Slim Whitaker. Also uncredited: Jones' equestrian co-star, Silver. Producer is Sol Lesser, director is Roy William Neill. Cinematography by Charles J. Stumar. LW3088: 9600 dpi jpeg from original lantern slide purchased 2017 by Leon Worden.